During my three-day weekend, I chose to return to a composition I painted several years ago, titled “Cold Desolation”(https://davidtripp.wordpress.com/2011/12/15/a-frozen-moment-along-route-66-at-christmas/). I had taken more than a dozen photos and processed them on 35mm Kodachrome slides a couple of decades ago. 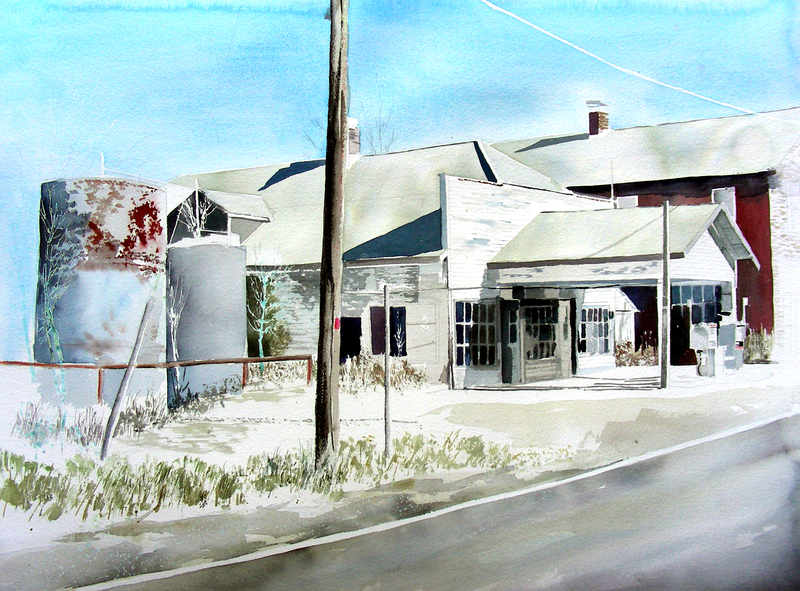 The “Cold Desolation” painting was of this abandoned gas station from a frontal perspective. Now I have chosen to paint it from this 45-degree angle, including the fuel tanks and the neighboring brick building, as well as trees backing the composition. I also have chosen a full sheet of watercolor paper (22 x 30″), rather than the mid-sized “Cold Desolation” composition. The original title was selected due to the weather being about 10 degrees when I photographed this site. Robertsville, Missouri is the setting for this defunct service station. Robertsville is defunct as well. The town is south of historic route 66, west of St. Louis, in eastern Franklin County, just six miles southwest of the town of Pacific. (http://en.wikipedia.org/wiki/Robertsville,_Missouri) I have photographed several abandoned structures from this town, but this service station is the only one I have managed to paint. The winter light was better on these buildings than the ones facing across the street. The three-day weekend was packed with plenty of obligations, but I found some space and temperate weather to retire to my garage studio and begin this painting after hours. My “companions” for the most part were VHS documentaries on Willem deKooning and Paul Gauguin. I enjoyed the communion as I thought of those great artists and their contributions, saddened that they are no longer among the living, though their immortal works will remain. And the sighs of melancholy that I experienced as I thought back over past memories that grow faint over time had an effect on this painting’s process that probably I alone know intimately. I was also tinged with the sad note of William Wordsworth and his “Lines Composed a Few Miles above Tintern Abbey; On Revisiting the Banks of the Wye During a Tour, July 13, 1798.” I recalled some of the words from this lyric poem on that winter morning when I encountered this “wild secluded scene” that impressed on me “thoughts of more deep seclusion” that connected “the landscape with the quiet of the sky.” This particular holiday weekend offered a few spaces of quiet seclusion, and I accepted those gifts in sincere gratitude, particularly late Sunday and Monday evenings in the studio. A part of me thinks that I could have been happier spending this day working in the garage studio, but on second thought, I doubt that. I’ll accept those late night gifts, and look forward to the next time I find space to paint. On a separate note (one which probably has no connection to this post), I did manage some quality reading over the weekend, mostly from Immanuel Kant, of all people. I have, throughout the years of my education, found this man’s thought a tough nut to crack. But this weekend, a few fissures opened, and I finally caught a glimpse into some of his work that yielded some fine food for reflection. I am most intrigued with his intellectual “Copernican Revolution” and its implications for thinking in the centuries since the 18th. I may be posting some of those a little later, when they’ve had more time to mature. Thanks for reading. I have had no computer access for four days, and am most happy to be back at the blog, especially since I have a new painting emerging.